I had under half an hour spare the other afternoon and managed another really quick card - inspired by a little stamp that is so cute. It sits on a shelf within my line of sight in the craft room. - coloured the bees with a couple of yellow Pro markers and added some clear Wink of Stella to the wings - done! Bad girl - I've had that set of 'Distressed Baptisia Collage' dies for over six months now, and this is only the second time I've used it, two still haven't even had contact with card yet. Today is the day of the 'big craft mess' up in Coventry - wish us luck! About a week ago I was idly flicking through the box of received/shop bought Christmas cards that I always hang onto after each Christmas. Am quite selective though and if I truly can't see any way a card could be up cycled then it goes off to one of the supermarket collecting points in January for The Woodland Trust. I always hang onto hand made/crafted cards and absolutely love looking through them - those I won't ever part with, or re-use, needless to say! I love robins and it's such a pretty card just as it is really. But, nine on one card seemed much too tempting not to have a play with. The images are quite small, about 1.5" square each and no sentiment, but a die set that I bought not too long ago came to mind. - backed each aperture with red line tape and trimmed the images so there was a good overlap before adding them behind the apertures. One tip, I added all the red line tape around the apertures for each single square before starting to add the images from behind (by eyeballing from the front of course) and then just peeled off as much backing as was needed as I went. Reason? Too much of a chance of accidentally sticking bits where not needed - remember am still recovering from 'turquoise-gate' here! - then, using the Misti I aligned a stamp from the triple stamp Inkyylicious 'Seasons Greetings' sentiments set and inked it up using Memento 'Tuxedo Black' ink and stamped it in place - phew, always a risk but it worked just fine! Should have done that earlier really but I just couldn't visualise which of the sentiments in the triple set would look best. The die set also comes with an outline die to cut those frames in a row, 'free-standing', as an 'add-on die to a card top - if that makes sense And there are also three dies to cut smaller 'stitched' square inserts or cutouts. Really versatile! They also do a two by two die (ie, four squares) and I so wish I could recall just who perked my interest to go hunting! Apologies but I do look at so many blogs each week, sigh. Bad for the purse! Card(s) all done, and I had three almost the same - apart from the slightly different images and the in-house critic gave them a double thumbs up - yay! This card is for Craftyhazelnut's Christmas Challenge #300 -'Use a sentiment' of course. 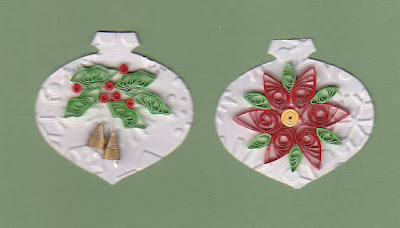 As well as Hazel's other Christmas challenge blog, which is Craftyhazelnut's Christmas Challenge Extra for September. The current challenge over at Addicted to CAS (#97) is 'Stitched'. I had several ideas for my entry but time was against me due to the impending 'expedition'. In the end I made this card literally in 10 minutes flat, probably a first for me! - added the word 'friend' using the Misti, Memento 'Tuxedo Black' ink and a stamp from the Paper Smooches 'Sentiment Sampler' set - oh how I do love those sentiment stamps! And to think, I'd never used this stamp before despite having it for ages. It was one of those buys when you just don't feel it's right somehow. I think it's because each petal on the image transfer on the wooden back of the stamp is a different colour with the detail all coloured in different colours too - and it looks quite garish. I even offered it for sale on here a while ago and was totally underwhelmed by a rush of interest, then I thought I'd just give it away at some point and popped it into a box of slightly unloved stamps that I didn't think I'd ever use again. This coming week will see me 'missing in action' from Thursday to Sunday at 'The Midlands Great British Craft Festival' in Coventry with Kim and Mrs A, two of our Playmates from the Snippets Playground. If any of you plan to be there and would like to meet up - do let me know! The Friday is a pre-booked day of workshops - and they're mostly - shudder - mixed media! We booked this little jolly back in July after our Southampton meet up with Darnell, well before I had a first play with the dreaded 'messy stuff' - should be verrry interesting :) Sigh. We plan to be there all day Saturday at the Fayre as well - doing some shopping no doubt and may even pop back for a last look on the Sunday morning before setting off for home again. That means I'll be scheduling next Sunday's snippets post (Week 249) with a new Mr Linky and a new prize to be won. But, my post won't include any picks or the winner of this coming week's prize. Those will appear on a bigger than usual Week 250 on 9th October, with some picks from the whole fortnight as well. Doing things this way has been really made all the more possible just a day or two ago by our lovely Jane W offering to act as Prefect when she picked up that I was going to be away for a few days. So Jane will be commenting over this coming week and will let me have a note of her picks in time for the post I'll do for Week 250. I'll still be trying to peek into the Playground now and then but, although we'll have wi-fi where we're staying whilst away, a lot of the time will be spent totally out of touch with the internet - so I can't thank Jane enough for her really kind offer to 'babysit' you for this week. We've gone for the whole week as it frees some time up for me before going away and also gives Jane the chance to build up her possible 'weekly picks' list. What a lovely bunch you girls are! It really has been such an enormous help now and then (notably from Sarn and Eve) to have someone step in to help out when things here become stretched. I love these little stamps and dies - I made it look as if my snowman was juggling one lonely snowball :) Would be great for Christmas gift tags too of course. Crumbs, almost forgot! It's Rudolph Days over at Scrappy Mo's from today until the end of the month - so I'm linking this card into one of my favourite challenges! LOVE this paper quilling, made by Val. The detail is amazing and a super use of snippets of course. Gorgeous paper piecing, by Bonnie. The little secret is that those lovely flowers were originally coloured with a gold Uniball pen and Bonnie hated the result - so it's a real lesson in hanging on in there and using paper piecing to cover up the gold. Thereby saving a really lovely background to end up with a beautiful card. So lovely to see Elizabeth back playing with us after a little break - and I just had to pick this card for those amazing blue poppies! Stunning colouring and a beautiful card altogether. Ruth came back to play as well, after almost 12 months of 'truancy' - and what a card she brought too! 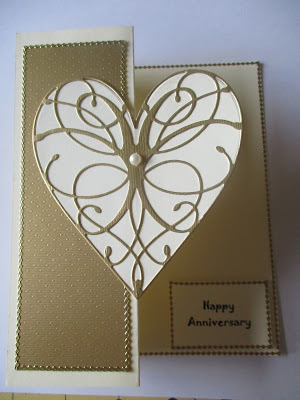 That amazing die (Memory Box 'La Rue Heart') is so elegant isn't it - a beautiful card! Absolutely had to include this really fun card, made by Megan. I think it's a brilliant idea, just get those circular dies out with some green, white and red snippets and away you go! BTW, the 'pips/seeds' were made from little punched out hearts and then covered with glaze. So clever! 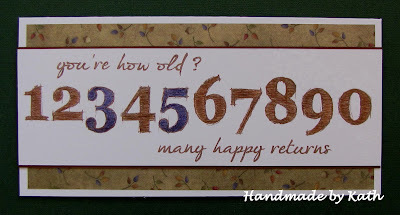 Another brilliant idea for a card came from Kath - this one is for a 35 year old. It's perfect for either male or female but really does solve those difficult to make cards for chaps! 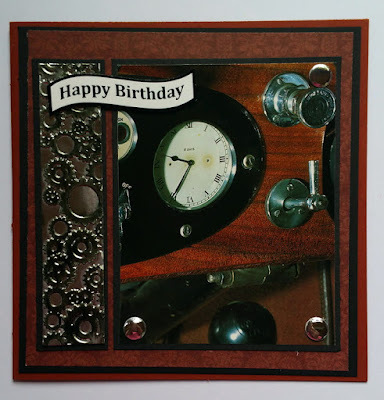 This card made by Carole D is so elegant and also very clever as well. I don't think you could beat this for a design for a 3rd Wedding Anniversary card could you? Those three hearts are just perfect! Stopping there at eight picks for this week. Each week I tell myself to only show three picks but it's almost impossible to limit numbers as each and every entry is worthy of showing. We had one new Playmate last week, out of a total of 63 of you who came to play - so busy, standing room only at times! Isn't this just the most terrific Star Wars paper pieced double layout? Brought to us by 'All Kinds of Crafty' - sorry I don't know your real name but you're so welcome to join in the Playground and we hope you come back to play again! And it's prize draw time, for the bumper bundle of the Spellbinders dies, the Penny Black flower stamp and the Paper Smooches sentiments stamps set. Well done Lynn! I'm finding it harder to keep up with when people last had a Playground win as we're almost up to 250 weeks since I took over from Jules, but am sure it was a good while ago Lynn! Possibly as long as a year or so. Can you please drop me an email with your address in and I'll post your prize off as soon as possible! My email address is on the right hand side bar. I'm asking folk to do this just in case I have an old address or there are any other issues with posting their prizes. I'd like to post this off as early as possible this coming week so am hoping that Lynn sees this and gets in touch ASAP. Here's this coming week's prize and it's so, so cute! The lovely Megan totally surprised me a couple of weeks ago by sending a selection of goodies for the toy box - with duplicates for me to play with as well! 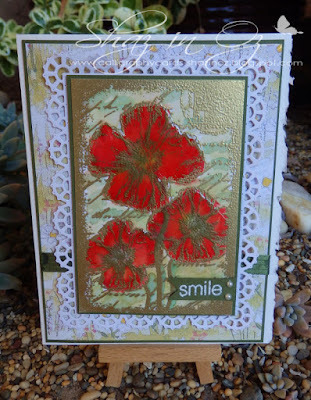 Thank you again Megan - I really had such fun using my own set of Poppy Stamps 'Love Never Melts' stamps and dies. And, there are more stamps to come from Megan folks - but I'm saving those for now. Both these items make up one prize, they are made to go together of course. The Snippets Challenge will run for one week and the Playground gates will close at 11am UK time on Saturday 1st October. The gates will open again at midnight UK time on the same day. A maximum of ONE entry and please say in a comment if you wish to play and be a possible winner of the prize, which won't be split of course . Please also link back to the Playground in your blog post to be eligible for the draw. Mr Linky is below - please let me know if you have any problems linking, it's easy for me to sort out so don't struggle on alone :) I'm hoping all runs smoothly with the linking as I hate tinkering on a notebook/pad and the laptop will be at home having a few days rest. - stamped '# SELFIE TIME' using the Misti, Memento 'Tuxedo Black' ink and a newish set of stamps that I spotted over on one of your blogs. 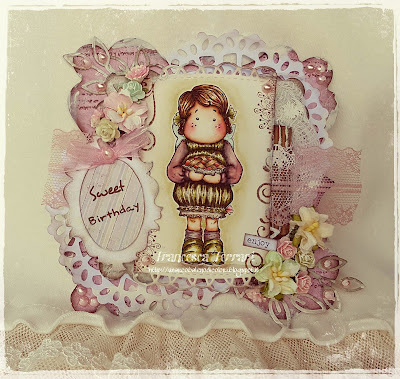 It's called 'Good to be Bad' by Clearly Besotted - that # stamp is so tiny, bet I lose it before too long! Okey dokey, after the 'big mess' with mixed media here I decided to revisit a technique for the current CAS Mix Up Challenge, which is marbling plus two other techniques of your own choosing. I figured that after the MM fiasco - 'shaving foam marbling' would be a total breeze. Ha! Not so! Somewhere along the way I managed to press a Dylusions spray bottle with the nozzle pointing right at the lap top! Such a fetching shade of turquoise immediately covered the silver flat part, thankfully in front of the keys though. What a scramble for baby wipes! Luckily it all cleaned up fine but did absolutely nothing for my confidence at playing with anything other than straightforward paper! My additional techniques to the marbling are die cutting and stamping BTW. I'd used Distress Ink refills when I tried this previously, which came out very pale and soft so was quite astounded at how vivid the Dylusions inks are. Love them though! I quite like the impression of movement in the marbled piece - but it's nothing compared to the rapid scramble here when I had the 'leetle accident' and sprayed the laptop turquoise. I really shouldn't be let loose to play! NB! Edit to say that the new challenge wasn't yet up and running. Jannie has now sorted it out! We'd love to see you over at Cuttlebug Mania and the challenge runs for two weeks. It's always useful to have a new home card on hand, I've been caught out a few times in the past when a 'we've moved' card has arrived here out of the blue and it's been a scramble to make a New Home card! Good grief, from really hot and humid, we then had horrendous thunder storms on Thursday night over a lot of the UK. The air was much fresher yesterday and today (Saturday) it's positively Autumnal! Bit of a plummet in the temperatures overnight and it's not terribly warm even as today wears on. Mind you, that might mean a few Christmas cards appearing in the Snippets Playground? :) I read somewhere during this past week that it's only 100 sleeps until Christmas arrives. OK, I bet you truly did so not want to hear that! 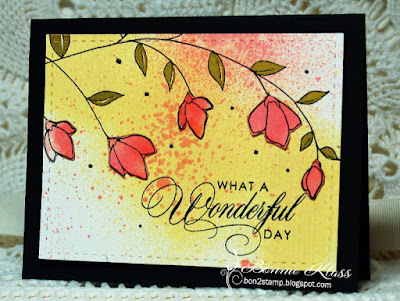 Hindsight being 20/20 vision, perhaps I should have used a less 'bold' stamp with the delicate flower - but as you might guess, I wanted to use certain items to make this Sunday snippets card. It's been in my mind for a while, and the duplicate goodies have also been waiting in the Toy Box for a while too! Jules really kicked me into action with her lovely post about paper piecing (featured as one of last week's picks) as the stamp lends itself so well to that technique. I just checked back through the blog here and it's almost five years since I bought this Penny Black stamp from a lovely friend (pre-loved). And, shame on me, this is only the second time I've used it! I picked this card, made by Lynne in NI, for a few reasons. Love the image, great colouring and use of snippets too. And the thing that pulls the whole card together is that lovely striped butterfly - clever idea to introduce just a little piece of the patterned paper into the main image panel. Carole hopped into the Playground waving this fabulous card, which immediately went onto my 'tips and ideas' list. Quite apart from being a really beautiful and very feminine design - I just love the wavy die cut lace edge to the side of the card. Instant impact! I've spotted a few cards using this sort of 'vertical wave' idea, either flat part way across a card or down one edge and it's so eye catching! I totally adore this wonderful and very magical looking card, made by Karen P. So much beautiful detail - the more you look the more you see. It's a bit like looking into fairy land - and great use of loads of snippets too! I know that a few of you lovely Playmates have brought really beautiful cards made using 'That Folder', which was a prize won by a few of you recently. 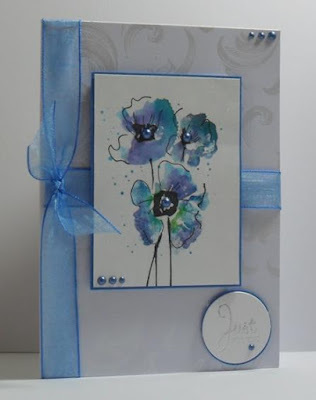 I just have to let you see this card, made by Jenny L using her embossing folder. Isn't it stunning? Monochrome at its very best! Some people say in comments that they really don't know how I manage to choose the weekly picks - given my way I'd feature every single entry! I'm sitting here so conscious of the lovely makes I don't have the time to show you and do encourage you to get a cup of tea, coffee or whatever, and take the time to have a hop around each week's entries. There's so much talent and variety in this challenge! Shaz in Oz came to play again this week, I'm so pleased to see that slowly she's returning to blogging and feeling better as time goes by. I love this card and really do suggest you nip over the Shaz's blog for a closer look - the gold and red are just incredible! Always so difficult to take photos of gold/silver and certain colours, unless you're at a weird angle! I absolutely adore this card, made by Francesca! So much pretty detail, a cute image and beautifully thought out and balanced - as well as loads of snippets used of course! A good while ago I attempted to make cards of a similar ilk and basically had to accept that they were out of my league! I've saved this card, made by Jane W, to the last as it sums up Autumn so perfectly! And we're fast heading into the 'season of mists and mellow fruitfulness' here for sure. I love those toadstools and the addition of the beautiful Autumn coloured leaves down one side is brilliant! I'm stopping at nine picks - more than I usually have time for. Right now there's a basket of ironing calling my name so I'd best move along! And it's prize draw time, for the stamps on offer - House Mouse cling 'Rain Flower' and the Kaisercraft 'True Friendship' set of four sentiments. Can you please drop me an email with your address in and I'll post your prize off as soon as possible! My email address is on the right hand side bar. From left to right we have: Spellbinders Labels Ten set of dies, Penny Black ''dotted petals' stamp (I was thrilled to find this available new on line to offer!) - and a final set of sentiments stamps from Tara of Seven Hills Crafts - one of my favourite Paper Smooches sets called 'Sentiment Sampler'. We actually had a sentiments stamp set the same back in February as part of a prize, which Jean won. All of these items will make up one prize if the winner wants that. Otherwise, you can select one or two of the items only - in which case I'd do additional draws for whatever is left. But I do need to know in advance please. The Snippets Challenge will run for one week and the Playground gates will close at 11am UK time on Saturday 24th September. The gates will open again at midnight UK time on the same day. A maximum of ONE entry and please say in a comment if you wish to play and be a possible winner of the prize - either all of it or just one or two items. Please also link back to the Playground in your blog post to be eligible for the draw. More gift cards, using a lorra stamps! As is the way of things, I needed more cards (six for now) to enclose with Snippets Playground prizes. - background 'Hello etc.' stamped using Memento 'London Fog' ink and a stamp from the Hero Arts 'Dictionary Greeting' set - all the stamping was done using the Misti as I had six to make remember?! What a laugh really. I trotted into our local Hospice Charity shop a couple of weeks ago and bought (for a whole 50 pence!) a copy of the Oxford Dictionary - with this card in mind. I'd totally forgotten that I had the Hero Arts set of four stamps sat sitting, unused, in a box here! ........... I'm not sure there'll be a repeat performance. I completed my very first, and also possibly very last, attempt at 'mixed media'. Having accumulated loads of stuff to play with, for about the past couple of years or so, finally bit the bullet - on Friday afternoon of last week. I then had a further play on Saturday afternoon, Sunday late afternoon, Monday afternoon and then finished it off on Tuesday morning. I make that five different days! I'm not sure I can be doing with so many steps and stages, the horrendous mess and a desk looking as if a bomb just went off! I'm a clean as a whistle kinda crafter, my stamps are all pristine and kept meticulously clean, everything is put away again once I've used it - and I hate having half finished stuff hanging around waiting to dry or for the next stage. - ha! So now the butterflies and hearts totally blended into the backgrounds didn't they? To counter that I took a broad nibbed gold calligraphy pen and went round all the edges of the butterflies and the hearts - as well as adding a few scribbles to the fronts as well. It looks just like gold leaf in real life. Finally, called it done! Tell you what, that sentiment I used is somewhat ironic. If I knew I could NOT fail - I'd probably be churning out these by the dozen! But I seemed to hit so many issues along the way, many of which I've not even written about here. I had enormous encouragement via email from Sarn along the way although my guess is that it's the freedom to just throw what you like at things and see what happens that attracts many crafters to multi media. I take my hat off to them as it's most probably how true artists work - I now know that I'm a clean and 'non-messy' crafter, possibly more of an engineer, first and foremost. One good thing out of all this, I can enter it into Mrs A's latest Butterfly Challenge #62 which is Butterflies + L is for Letters and/or Lavender. Yay! The funny thing is, my in-house critic likes it a lot. Then he asked 'so what are you going to do with it, where will it go?'. At that point I just shrugged and rolled my eyes ......... I have absolutely no idea! I do have a card to share today but wanted to make my apologies for being missing in action for a couple of days. On Sunday a lovely friend arrived unannounced bearing a card and gifts - it was such a delight to spend time catching up and putting the World to rights, and it kept me away from the laptop. Then yesterday was my Birthday and I have to first of all say a HUGE thank you for all the cards, gifts and many, many Facebook wishes. I will get back to each and every one of you I promise - I was quite humbled by the numbers, and glad I'd dusted the lounge and made space (albeit unwittingly) for an avalanche of beautiful cards. Len took me out for lunch yesterday (Monday) and after that he insisted that I should just play for a while and then cosy up in front of the TV - so I obeyed him for once! The other day Len was pottering in the garden sorting out the nightly chaos those messy hedgehogs leave behind, a little someone over the tall fence could obviously hear the occasional clatter too. Then this little voice piped up 'Hello Len' :) I heard it indoors and had to laugh at Max and Len having a little conversation - totally invisible to one another! Here's the link to My Cute Graphics where I found the image. There are tons of images there and I do recommend a visit!